The paintings of artist Arturo Miramontes will be featured by the Town of Cicero at a reception on Tuesday, Sept. 9th in the Cicero Town Hall Lobby, 4949 West Cermak Rd., Cicero from 6 pm until 8 pm. Miramontes was born in Momax, Zacatecas, Mexico. He moved to the United States in 1972, became a U.S. citizen in 1985 and now living in Hammond, Indiana. A self taught-artist he studied briefly under the world renowned illustrator Mohamed Drissi. He developed his own style of studio painting using realistic and symbolic images in his oil paintings. 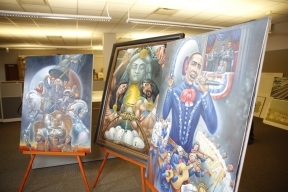 He is nationally known for his historical symbols, blending strong vibrant colors to depict the struggles of Mexican-Americans, undocumented immigrants, and the Chicano movement in the United States.